Thirty years after the end of the war, three Vietnamese combat veterans—Dang Van Tho, Hoang Cong Doan and Tran Thi Tiep—undertake a search for the missing remains of fellow soldiers of the Vietnamese People's Army. The now middle-aged men, who express a sense of guilt for having left the bodies of their comrades on the battlefield, visit a number of sites but fail to locate any skeletal remains and are able only to commune with the spirits of their dead comrades. During their determined search the veterans meet with families of the deceased, consult with local government bureaucrats, and visit national cemeteries, including plots reserved for "unknown martyrs," in an attempt to find their comrades and bring their spirits "back home." WANDERING SOULS features their surprisingly vivid memories of thirty-year-old battles with American troops, and detailed accounts of how their comrades died, as well as the heartrending stories of widows and mothers, revealing the devastating impact of the "American War" on marriages, families and friendships. 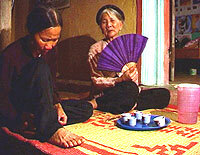 Tran Thi Tiep, the widow of one of their long-dead comrades, agrees to join them in the search for her husband's body, which for her involves a lengthy and expensive trip, a search of a national computer database of war dead, a fruitless search of a local cemetery, and Buddhist prayer rituals that attempt to evoke the spirit of the deceased. The emotional depth of her grief, even after thirty years, is extraordinarily moving. 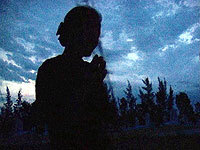 WANDERING SOULS may prove to be both an unsettling and enlightening experience for American viewers, since this Vietnamese version of our own MIA issue not only personalizes Vietnamese victims of the war previously regarded as faceless enemy combatants, but also highlights the universal nature of such war-related emotions and concerns. As the grieving widow explains, there is "nothing more precious than a grave to visit."